The Tampa Bay Buccaneers rank 16th in DVOA offense and have the 5th-graded PFF unit. They have faced the 12th-easiest schedule of opposing defenses. The Carolina Panthers rank 17th in DVOA defense and have the 20th-graded PFF unit. They have faced the 24th-easiest schedule of opposing offenses. Tampa Bay has the advantage here, as this looks like a high scoring affair on both sides. The Tampa Bay Buccaneers rushing attack is off the radar this week, per usual. They rank 23rd in rush success rate and have generated 17 explosive runs (ranked 27th). They face off against a Carolina Panthers run defense that ranks 7th in rush DVOA and ranks 5th in rush success rate allowed. They also rank 26th in fantasy points allowed to the RB position, and have allowed 20 explosive runs (ranked 22nd). If you want to take the plunge on a dirt-cheap Peyton Barber, the real issue is opportunity cost and ceiling. His median projection places him as a positive value on DK at just $3,6000, thanks to projected MS carries around 65% that aligns with the work he received last week. Barber has already received 60% of carries for this team inside 10 yards, and will not have to compete with Ronald Jones this week for that work. It’s a low-end dart throw at best. In the passing game, the Tampa Bay Buccaneers are in a much better situation for DFS. They rank 8th in pass success rate and have generated 34 explosive passes, third-most in the NFL. They’ll be facing a Carolina Panthers pass defense that ranks 20th in DVOA and 13th in pass success rate allowed. They also rank 22nd in fantasy points allowed to the QB position, and 29th in points to the WR position. Deep threats are in a decent spot, as the defense has allowed 27 explosive passes (ranked 13th) this season. Both DraftKings ($5,500) and FanDuel ($7,100) have severely underpriced Ryan Fitzpatrick in a matchup that should be very conducive to Tampa Bay vertical passing attack. The Panthers defense skews towards allowing passing TDs, and the same can be said for the Tampa Bay offense. Mike Evans is a question mark after getting in a limited practice Thursday. I expect him to go, and he currently leads the WR group in the ever-important end zone targets stat. Godwin isn’t far behind in terms of targets inside 10 yards, and is priced appropriately to be included in game stacks. In terms of exploiting the vertical deficiency in the Panthers passing game, Evans (31.8%) and DeSean Jackson (25.3%) have the air yards profile and share to do the most damage. We should be stacking this team up and down. I want to point out that no team has allowed a higher target rate (25.4%) to the TE position than the Panthers this season, which is likely a driving factor in the top 5 fantasy points allowed factor mentioned at the top of the segment. I was surprised to see O.J. Howard has just one end zone target this season, but the matchup and price tag on DraftKings ($4,300) are most appealing for tournaments on this slate. The X-Factor: Mike Evans and Chris Godwin in the end zone. DeSean Jackson on vertical routes. The Carolina Panthers rank 5th in DVOA offense and have the 16th-graded PFF unit. They have faced the 3rd-easiest schedule of opposing defenses. The Tampa Bay Buccaneers rank 32nd in DVOA defense and have the 31st-graded PFF unit. They have faced the 21st-easiest schedule of opposing offenses. The Panthers have the advantage here by a mile. The Carolina Panthers rushing attack is in the best spot they have seen in weeks, though it is nothing special overall. They rank 13th in rush success rate and have generated 37 explosive runs (most in the NFL) and will face the Tampa Bay Buccaneers run defense that is rank 15th in DVOA and ranks 10th in rush success rate allowed. Tampa ranks 16th in fantasy points allowed to the RB position and has allowed 22 explosive runs (ranked 17th). Christian McCaffrey has 52 targets, over half of the team’s rushing attempts inside the 10 yard line, and 16 runs of 10+ yards on the season. I examined the RG Projections and Derek Carty’s The Blitz projection system, and both have 20+ touch projections for McCaffrey including target projections of right around 7 each. In a high-total environment with elite opportunity expectations, we need to have CMC near the top of our lists in Week 9 at just $7,800 on DK (+1.67 RG Val) and $7,900 on FD (+3.04 RGVal). It’s an elite spot for the Carolina Panthers passing attack. They rank 9th in pass success rate and have generated 19 explosive passes (ranked 28th). They’ll be dealing with the Tampa Bay Buccaneers pass defense that is dead last in DVOA and ranks 3rd in pass success rate allowed. They rank 2nd in fantasy points allowed to the QB position, and 5th in points to the WR position. Deep threats will be in a top-flight situation, as the secondary has allowed 31 explosive passes (ranked 6th) thus far in 2018. The Panthers have allowed Cam to be pressured on just 27.31% of occasions this year, and the TB defense has forced a 31st best 27.3% of pressures. 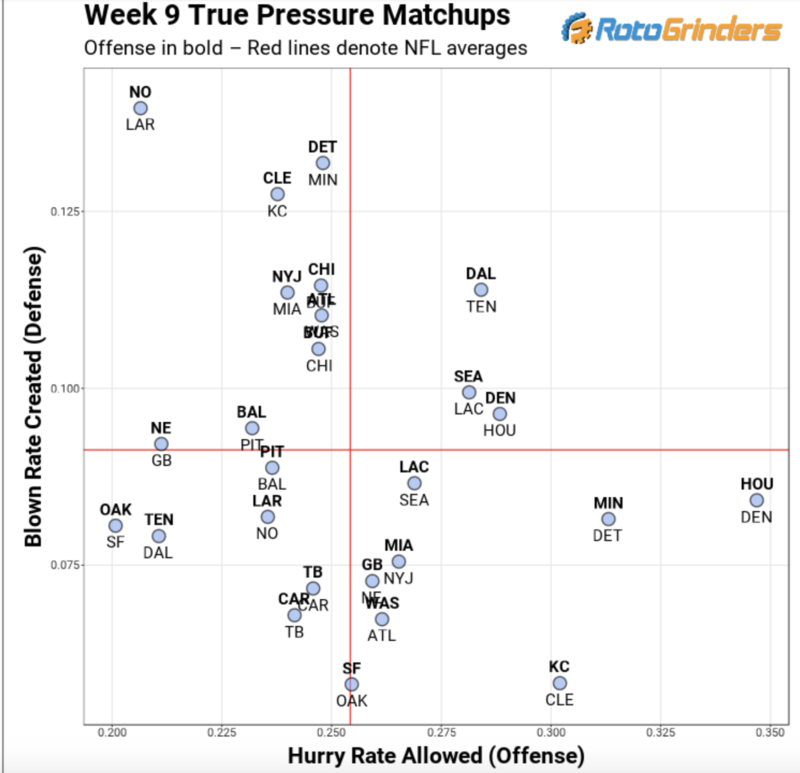 We can see this disparity in the True Pressure rate matchups chart below, as Carolina appears in the lower left quadrant where we prefer them. Newton is a top-10 passer in a Clean Pocket with a 104.8 rating in 2018. Jam Cam in all formats. It will be tough to find a favorite passing target among the group of pass catchers to pair with Newton, but sign me up for whoever is facing TB in the slot every single week. Slot corner M.J. Stewart is PFF’s 85th-graded CB out of 110 qualifiers, and he is looking pretty banged up missing practice Wednesday and Thursday. I shutter to think about who can’t get on the field ahead of him, but it can’t be anyone good. Thanks to Sports Info Solutions, we can see who ends up running routes in the slot with precision. Carolina has been deploying pass catchers differently in recent weeks, and I can see that there is a clear winner in slot routes: Greg Olsen. D.J. Moore is also lining up there and will benefit from the absence of Torrey Smith. Olsen is not cheap on DFS sites at $4,700 on DraftKings and $6,200 on FanDuel, but looks like a phenomenal GPP pairing with Cam Newton in what figures to be the most pass friendly environment he’s seen since he returned from injury. Moore should be more popular, but is also significantly more explosive than Olsen and should be considered a high-end GPP option. The Pittsburgh Steelers rank 8th in DVOA offense and have the 15th-graded PFF unit. They have faced the 16th-easiest schedule of opposing defenses. The Baltimore Ravens rank 6th in DVOA defense and have the 8th-graded PFF unit. They have faced the 27th-easiest schedule of opposing offenses. The matchup is relatively neutral, with the Ravens perhaps being a slight favorite due to their status playing at home. The Pittsburgh Steelers rushing attack is in a below average spot this week. They rank 18th in rush success rate and have generated 20 explosive runs (ranked 19th) going up against a Baltimore Ravens run defense that is ranked 5th in rush DVOA and 31st in rush success rate allowed. They also rank 29th in fantasy points allowed to the RB position and have allowed 27 explosive runs (ranked 7th). Volume won’t be the reason Conner fails this week, and maybe he won’t. Projecting him for 80% of rush attempts and 14% of targets is reasonable. The efficiency of those carries and targets is what we have to be concerned about, and the Ravens general ability to limit points. Conner is a secondary option as a result, as we can see the broad matchup for RB success below is sub-par. In the passing game, the Pittsburgh Steelers are looking like a long shot in DFS. They rank 14th in pass success rate and have generated 29 explosive passes (ranked 9th). They’ll be facing a Baltimore Ravens pass defense that ranks 10th in DVOA and ranks 32 in pass success rate allowed. They also rank 24th in fantasy points allowed to the QB position, and 25th in points to the WR position. Deep threats are in a difficult spot, as the defense has allowed just 22 explosive passes (ranked 25th) this season. 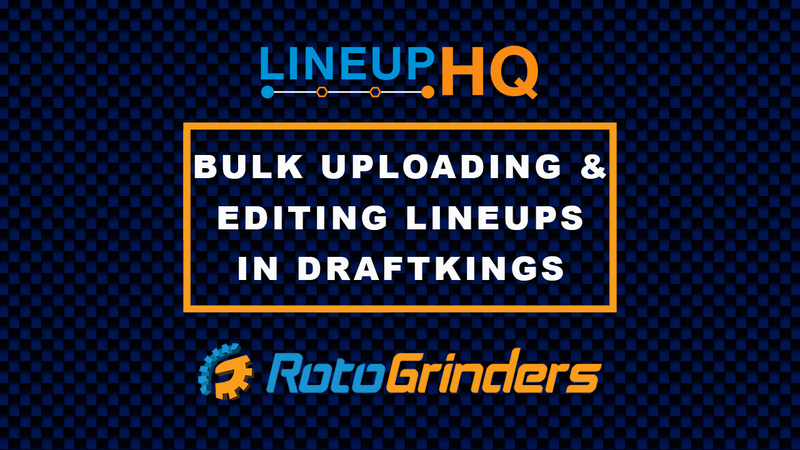 Rather than try to make a point about what Steelers pass catcher you could use, take the advice of our five Top-100 DFS players on RG Premium Filters and just avoid them. Only STLCardinals84 had any Steelers tagged in our premium filters, and it’s the matchup proof Antonio Brown in GPPs only. Top players will have their attention elsewhere this week and you should, too. The Baltimore Ravens rank 14th in DVOA offense and have the 23rd-graded PFF unit. They have faced the easiest schedule of opposing defenses. The Pittsburgh Steelers arnk 22nd in DVOA defense and have the 19th-graded PFF unit. They have faced the 30th-easiest schedule of opposing offenses. This is a neutral matchup based on the mid-tier rankings of both teams and polar opposite strength of schedules. The Baltimore Ravens rushing attack is in a sub-par spot this week. They rank 14th in rush success rate and have generated 20 explosive runs (ranked 19th). They face the Pittsburgh Steelers run defense that is ranked 11th in DVOA and 27th in rush success rate allowed. They rank 31st in fantasy points allowed to the RB position and have allowed 22 explosive runs (ranked 17th). We have a 15-touch projection for Alex Collins, and while that seems fair, I could see him getting one or two more than that. That being said, $4,600 on DraftKings and $6,200 on FanDuel can buy alternatives with higher ceilings and perhaps higher floors as well. Collins was a beast in yards after contact last year, but the magic has not persisted in 2018. That makes me hesitant to trust him in a tougher game environment. It’s a also a below average matchup for the Baltimore Ravens passing attack. They rank 18th in pass success rate and have generated 26 explosive passes (ranked 18th). They’ll be dealing with the Pittsburgh Steelers pass defense that is ranks 23rd in DVOA and ranks 27th in pass success rate allowed. Thanks to strength of schedule, they rank 8th in fantasy points allowed to the QB position and 10th in points to the WR position. Deep threats will be in a below average situation, as the secondary has allowed just 26 explosive passes (Rank 16) thus far in 2018 despite having faced three of the top 10 explosive pass offenses. John Brown has fallen off his rather impressive air yards share pace from earlier in the season, though the Ravens as a whole are still providing him plenty of opportunity thanks to volume of deep targets. Flacco remains #1 in deep ball attempts, and Brown has a ridiculous 38.33% of his targets more than 20 yards down the field. Good matchup or not, that kind of profile makes you GPP viable for as long as your role in the offense contains that many high leverage targets. The New York Jets rank 29th in DVOA offense and have the 29th-graded PFF unit. They have faced the 29th-easiest schedule of opposing defenses. The Miami Dolphins rank 23rd in DVOA defense and have the 27th-graded PFF unit. They have faced the fourth-easiest schedule of opposing offenses. The Dolphins bad defense somehow has the advantage here by the numbers. The New York Jets rushing attack is in about as good a spot as you can find this week. They rank 32nd in rush success rate and have generated 22 explosive runs (ranked 17th), and they’ll face a Miami Dolphins run defense that ranks 16th in rush DVOA and 26th in rush success rate allowed. They also rank 3rd in fantasy points allowed to the RB position, and have allowed 30 explosive runs (ranked 4th). The fact that the Jets will be short-handed at the WR position coupled with the return of Elijah McGuire should force the Jets hand to a RB/TE heavy approach in this matchup. The split between the three available backs should be wide enough and devoid of targets to the points where we don’t need to consider them in DFS. Crowell should see roughly 50% of carries and below 5% of targets. He’s averaged 6% of targets prior to the arrival of McGuire, who should take Powell’s work and then some. In the passing game, the New York Jets are in a slightly above average matchup, but it’s an avoid for DFS. They rank #28 in pass success rate and have generated 24 explosive passes (ranked 21st). They’ll be facing a Miami Dolphins pass defense that is ranked 26th in DVOA and ranks 9th in pass success rate allowed. 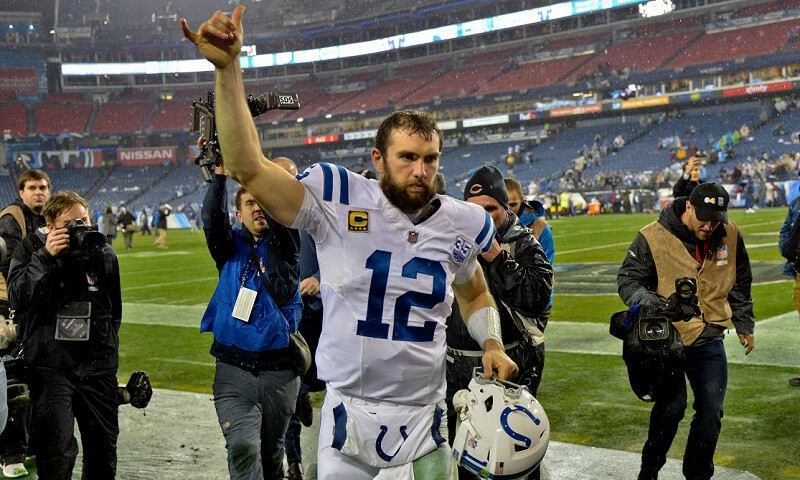 They also rank 13th in fantasy points allowed to the QB position, and #12 in points to the WR position. Deep threats are in an above average matchup, as the defense has allowed 29 explosive passes (ranked 10th) this season. The Jets could be missing three of the top seasonal leaders in team share of air yards, which would normally be something to get hyped about. However, my DFS alerts app just messaged me legit 1 second after I wrote that to say Robby Anderson and Quincy Enunwa were working off to the side at practice Friday. If they are in, the options get slightly better for the Jets and perhaps they could find passing game success to a low degree. If they are out, we’re looking at 33-38 passing snaps of uber-jabroni Jermaine Kearse, near-retired Rishard Matthews, and scrap-heap #teampreseason left-over Deontay Burnett failing to get open and praying for a contested catch win. Let’s just not and say we did with these Jets. Sunday AM Update: I might tinker with some Elijah McGuire at min salary on DK as a roster construction move. He’s uncertain to play a full role, but I’m willing to take a dart on it based on the preseason hype. The Miami Dolphins rank 13th in DVOA offense and have the 26th-graded PFF unit. They have faced the 27th-easiest schedule of opposing defenses. The New York Jets rank 10th in DVOA defense and have the 7th-graded PFF unit. They have faced the 9th-easiest schedule of opposing offenses. The Jets defense has been the better unit this season and we have to favor them on paper. The Miami Dolphins rushing attack is in a below average spot this week. They rank #6 in rush success rate and have generated 19 explosive runs (Rank 22). They will face the New York Jets run defense that is ranked 18th in DVOA and ranks 17th in rush success rate allowed. This season, the Jets rank 13th in fantasy points allowed to the RB position and have allowed 27 explosive runs (ranked 7th). I’m looking at projections for Kenyan Drake across the industry and thinking they are a bit generous to his share of carries. I would expect him to command less than half of the carries in a slow matchup of two teams that would rather run it and operate at a bottom barrel situation neutral pace. Miami allows blown run blocks at a fairly high rate, and I don’t think I can use a roster spot on either Miami runner. It’s a bland spot for the Miami Dolphins passing attack. They rank 19th in pass success rate and have generated 21 explosive passes (ranked 26th). They’ll be dealing with the New York Jets pass defense that is rank 7th in DVOA and ranks 24 in pass success rate allowed. They rank 10thin fantasy points allowed to the QB position, and #4 in points to the WR position. Deep threats will be in a mediocre situation, as the secondary has allowed a middling 27 explosive passes (ranked 13th) thus far in 2018. Even with Kenny Still missing two practices, I can’t find a high level of excitement for any of these Dolphins WRs, with target projections no higher than 20% for anyone. Their expected fantasy points have been dismal with similarly mediocre shares of the offense in Week’s past. You could dart throw Danny Amendola (79% slot rate) to exploit the Jets weakness in the slot, but that’s now how I’m going to choose to live my fantasy football life. The Chicago Bears rank 11th in DVOA offense and have the 22nd-graded PFF unit. They have faced the 6th-easiest schedule of opposing defenses. The Buffalo Bills rank 4th in DVOA defense and have the 11th-graded PFF unit. They have faced the 10th-easiest schedule of opposing offenses. The Bills have the advantage here on paper, but will suffer due to the projected ineptitude of their offense. The Chicago Bears rushing attack is in a fair spot this week thanks to positive projected game flow. They rank 4th in rush success rate and have generated 26 explosive runs (ranked 10th), a solid attack which they will uncoil against a Buffalo Bills run defense that is rank 12th in rush DVOA and ranks 22 in rush success rate allowed. They also rank 8th in fantasy points allowed to the RB position, and have allowed 29 explosive runs (rank 5th). 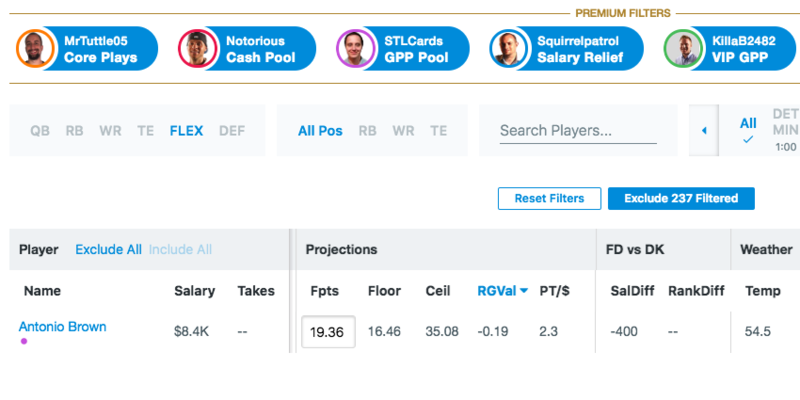 You can paint a picture in GPPs where a $4,700/$6,200 Howard eclipses his projected 54% MS carries in a game in which the Bears command the ball all day and with the lead. He is already the owner of a huge 76.9% of carries inside the 10 yard line, and if the TDs ever get paired with a 100 yard day he could obliterate this price tag. I would call this situation in play for that kind of outcome. 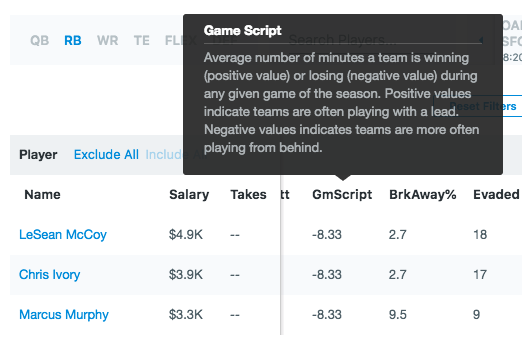 In the passing game, the Chicago Bears are in a below average situation for DFS. They rank 16th in pass success rate and have generated 24 explosive passes (ranked 21th). They’ll be facing a Buffalo Bills pass defense that is ranked 4th in DVOA and ranks 12th in pass success rate allowed. They also rank 27th in fantasy points allowed to the QB position, and #22 in points to the WR position. Deep threats are in a sub-par spot, as the defense has allowed 22 explosive passes (ranked 25th) this season. Allen Robinson could be a game time decision, and his absence would once again open the door for a heavy share of the offense to Anthony Miller and Taylor Gabriel. Miller is working on consecutive 7 target weeks, and while that is no lock to continue, he does also get the benefit of being somebody they trust for End Zone targets. He is tied for the team lead with 5, and scored last week. I feel like the $3,700 tag on DK is the only place I’d unroll this play at all, and I wouldn’t call it anything close to a smash spot against a solid pass defense in a likely low scoring road game. The Buffalo Bills rank dead last in DVOA offense and have the worst-graded PFF unit. They have faced the 24th-easiest schedule of opposing defenses. The Chicago Bears rank 1st in DVOA defense and have the top-graded PFF unit. They have faced the 11th-easiest schedule of opposing offenses. It is literally not possible to find a wider mismatch. The Buffalo Bills rushing attack is in a tough spot this week. They rank 24th in rush success rate and have generated 19 explosive runs (ranked 22nd) and will face the Chicago Bears run defense that is ranked 3rd in DVOA and ranks 24th in rush success rate allowed. They rank 31st in fantasy points allowed to the RB position and have allowed 10 explosive runs (ranked 32nd). The Bills don’t have a chance what so ever with Peterman under center and the rushing attack doesn’t have a strong enough pass catcher or overall workhorse to overcome guaranteed negative game script. The Bills RBs rank 31st in game script this season, and this matchup doesn’t appear likely to help improve on that. It’s the nut low spot for the Buffalo Bills passing attack and Nathan Peterman. They rank 32nd in pass success rate and have generated 18 explosive passes (ranked 30th). They’ll be dealing with the Chicago Bears pass defense that is ranked 5th in DVOA and ranks 19th in pass success rate allowed. They rank 25th in fantasy points allowed to the QB position, and 11th in points to the WR position. Deep threats will be in an extremely poor situation, as the secondary has allowed 21 explosive passes (ranked 27th) thus far in 2018. Nathan Peterman has 9 career interceptions and 9 career interceptable passes, per PlayerProfiler.com. Think about that. He’s bad. Add the worst supporting cast in the league at a -24.34 rating also per PlayerProfiler.com, and we need not associate ourselves with any part of this offense. Peterman at $4,000 on DraftKings is like the ultimate middle finger to analytics and the fantasy football tradition of paying down at QB, but I imagine you can pray for two passing TDs and hope the roster you make around it carries you home. I am in no way endorsing that, but rather pointing out that he needs very little to pay off that price. The Atlanta Falcons rank 9th in DVOA offense and have the 10th-graded PFF unit. They have faced the 25th-easiest schedule of opposing defenses. The Washington Redskins rank 14 in DVOA defense and have the 5th-graded PFF unit. They have faced the 3rd-easiest schedule of opposing offenses. The Falcons have the advantage here thanks to a soft schedule for the Redskins boosting the appearance of their skills. The Atlanta Falcons rushing attack is in an avoidable spot this week. They rank 28th in rush success rate and have generated 17 explosive runs (ranked 27th) against a Washington Redskins run defense that is ranked 22nd in rush DVOA and ranks 6th in rush success rate allowed. They also rank 27th in fantasy points allowed to the RB position, and have allowed 14 explosive runs (ranked 30th). We’re looking at something close to an even split of carries between Tevin Coleman and Ito Smith that makes it even easier to avoid the Falcons backfield. Coleman has the small edge in overall work share, but Ito is cheaper and has commanded the same share inside the 10-yard line as Coleman this season. I don’t think you use either of them this week. In the passing game, the Atlanta Falcons are in a middling situation for DFS. They rank 5th in pass success rate and have generated 27 explosive passes (ranked 14th). They’ll be facing a Washington Redskins pass defense that is ranked 9th in DVOA and ranks 28th in pass success rate allowed. They also rank 18th in fantasy points allowed to the QB position, and 21st in points to the WR position. Deep threats are in a low-end spot, as the defense has allowed 23 explosive passes (ranked 20th) this season. Julio Jones has amazing opportunity within this offense, but not included in that opportunity the chance to score TDs. Sure, Calvin Ridley and Sanu have both outperformed TD expectation by a LOT. Sure, Julio has a 29.4% of end zone targets. Still, with just 5 of his 81 targets being in the end zone he’s not exactly having a full-blown meltdown. He is still only expected to have scored 2 TDs on the season overall. What am I saying? It just looks like Julio won’t be a huge TD producer overall in this offense, but he should be better than he is right now with zero. With over 1,000 air yards in tow, there is no reason to be down on Julio week to week. In this matchup, I’d call him a GPP play with a ship load of upside based purely on opportunity share. The X-Factor: Pretending Calvin Ridley is dead to you. The Washington Redskins rank 21st in DVOA offense and have the 27th-graded PFF unit. They have faced the 9th-easiest schedule of opposing defenses. The Atlanta Falcons rank 31st in DVOA defense and have the 30th-graded PFF unit. They have faced the 16th-easiest schedule of opposing offenses. The Redskins offense is at the advantage here. The Washington rushing attack is in a superior spot this week. They rank 22nd in rush success rate and have generated 26 explosive runs (ranked 10th) facing the Atlanta Falcons run defense that is ranked 31st in DVOA and ranks 2nd in rush success rate allowed. They rank 6th in fantasy points allowed to the RB position and have allowed 24 explosive runs (ranked 13th). “Gap blocking” is a run play that is essentially designed to go to a specific location or gap. It’s more likely to be power type run that something that requires finesse. The Falcons have allowed top 10 damage to the play style this season and the Redskins are one of the most successful gap block success teams in the league. Adrian Peterson is 3rd in the NFL in Gap Block yardage, and averages a whopping 6.77 YPC on Gap runs. Get ready for another heaping helping of AP. He’s not even close to cash viable at $6,000 on DK but the 100-yard bonus and 2-TD upside keeps his name in the hat for GPP. I’m not sure you can use him at all on FD at $7,500. We needed him to fail last week so we could get him cheap this week, but just weren’t that lucky. It would be a solid spot for the Washington Redskins passing attack if they actually had one. They rank 20th in pass success rate and have generated 22 explosive passes (ranked 25th). They’ll be dealing with the Atlanta Falcons pass defense that is ranked 28th in DVOA and 5th in pass success rate allowed. They rank 3rd in fantasy points allowed to the QB position, and 7th in points to the WR position. Deep threats will be in a below average situation, as the secondary has allowed 23 explosive passes (ranked 20th) thus far in 2018. We can see below by the zero “takes” input by any of our content providers that nobody wants to take part in rostering the Washington pass catchers. Not even Jordan Reed is appealing at this point. I won’t try to be the first to make a case here for negative RGVal projections across the board. The Detroit Lions rank 17th in DVOA offense and have the 11th-graded PFF unit. They have faced the hardest schedule of opposing defenses. The Minnesota Vikings rank 13th in DVOA defense and have the 12th-graded PFF unit. They have faced the 26th-easiest schedule of opposing offenses. It’s a neutral matchup that could go either way. The Detroit Lions rushing attack is in a lower-tier matchup this week. They rank 22nd in rush success rate and have generated 20 explosive runs (ranked 19th), a skill set they will deploy against a Minnesota Vikings run defense that is ranked 10th in rush DVOA and 13th in rush success rate allowed. They also rank 19th in fantasy points allowed to the RB position, and have allowed 18 explosive runs (ranked 26th). The lower end matchup won’t stop the Lions from further morphing their identity into a more run centric team than we can ever remember them being in recent years. Projecting Kerryon Johnson for 60% of rushes or higher is now beyond fair, and inching up his target projection into double digits with the trade of Golden Tate is also a reasonable expectation. 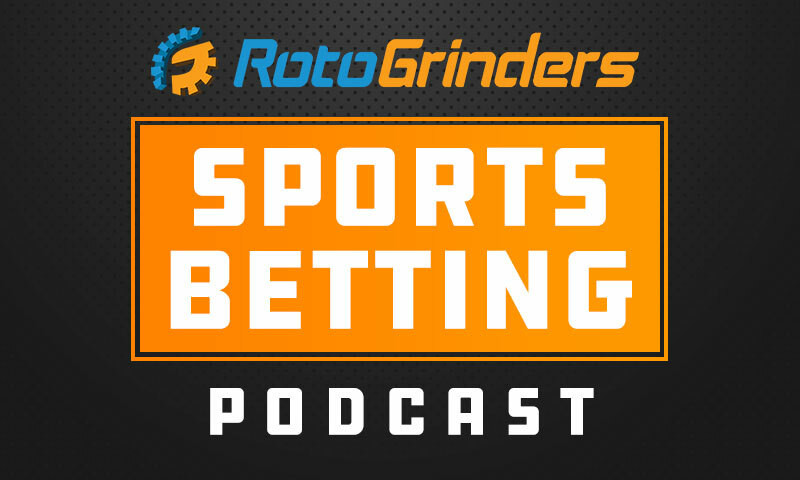 RotoGrinders projections are about the lowest out there on him at the moment and even our conservative projections have him near even value. The battle up front will be interesting, as the line for the Lions creates clean pockets and blocks yards before contact well. The Vikings defense does the opposite, and thus Kerryon’s day will likely hinge upon who wins this battle to some degree. In the passing game, the Detroit Lions are in a volatile situation for DFS with upside. They rank #13 in pass success rate and have generated 25 explosive passes (Rank 20). They’ll be facing a Minnesota Vikings pass defense that is rank #16 in DVOA and ranks 25th in pass success rate allowed. They also rank #11 in fantasy points allowed to the QB position, and #28 in points to the WR position. Deep threats are in a sneaky spot, as the defense has allowed 32 explosive passes (Rank 3) this season. The trade of Golden Tate opens up a wealth of opportunity for Marvin Jones and Kenny Golladay. Tate commanded 26.5% of targets and over 22% of air yards in the short to intermediate area. The target share should increase overall for Golladay and Jones, while guys like Theo Riddick and Kerryon Johnson benefit to a smaller degree. Priced at $5,300/$5,500 on DK and $6,500/$6,200 FD, both Jones and Golladay have the potential for spiked weeks based on the volatile passing matchup, their individual profiles as vertical + TD threats, and their potential for increased market share in the offense. The Minnesota Vikings rank 20th in DVOA offense and have the 8th-graded PFF unit. They have faced the 14th-easiest schedule of opposing defenses. The Detroit Lions rank 30th in DVOA defense and have the 28th-graded PFF unit. They have faced the 19th-easiest schedule of opposing offenses. The Vikings have the advantage on paper. The Minnesota Vikings rushing attack is in an exploitable spot this week. They rank 21st in rush success rate and have generated 18 explosive runs (ranked 24th). They will face the Detroit Lions run defense that is ranked 30th in DVOA and ranks 7th in rush success rate allowed. They rank 12th in fantasy points allowed to the RB position and have allowed 22 explosive runs (ranked 17th). Dalvin Cook will return in what will be a limited role this week, which rains on the potential Latavius Murray parade. As of now, he projected as a +.53 RGVal on FD and +1.68 on DK. Introducing Dalvin Cook at all soils this potential value play and takes the Vikings out of play in the run game. Previous to this news, I was excited to look at Murray as an option thanks to efficiency this season, evidenced by PlayerProfiler.com’s production premium stat. It’s a bizarre spot for the Minnesota Vikings passing attack, as the Lions pass defense is inefficient but the style of game they have forced has prevented big fantasy production to date. The Vikings rank 10th in pass success rate and have generated 27 explosive passes (ranked 14th). They’ll be dealing with the Detroit Lions pass defense that is ranked 30th in DVOA and #4 in pass success rate allowed. However, they rank just 26th in fantasy points allowed to the QB position, and #30 in points to the WR position. Deep threats will be in a modest situation as well, as the secondary has allowed 23 explosive passes (ranked 20th) thus far in 2018. One player I think we can continue to look at in this spot is Adam Thielen, and this is particularly true if Stefon Diggs (who was been limited and is questionable) can’t go. Thielen is the top-rated receiver in our WR vs. CB chart, facing Nevin Lawson and his 123.3 rating allowed when targeted. If Diggs is out, Lord Aldrick Robinson and Laquon Treadwell get a boost. Kyle Rudolph may also be in line for an increase if Diggs is out. The Lions have allowed the 4th-most targets to the TE position so far at 22.9%. The Kansas City Chiefs rank 1st in DVOA offense and have the 2nd-graded PFF unit. They have faced the 31st-easiest schedule of opposing defenses. The Cleveland Browns rank 3rd in DVOA defense and have the 23rd-graded PFF unit. They have faced the 31st-easiest schedule of opposing offenses. The Browns have shown ability, but the dangerous Chiefs have the advantage here. The Kansas City Chiefs rushing attack is in a near smash spot this week. They rank 6th in rush success rate and have generated 24 explosive runs (ranked 12th). It’s a solid performing squad that will face a Cleveland Browns run defense that is ranked 27th in rush DVOA and ranks 8th in rush success rate allowed. They also rank 5th in fantasy points allowed to the RB position, and have allowed 41 explosive runs (ranked 1st). One of the most likely outcomes of this game is a dominant KC performance. The positive script theoretically works in Hunt’s favor, and his median expectation per projections is already a massive +2.66 (DK) / 3.38 (FD) RGVal. With plenty of other options on this slate, I am not certain he’ll be rostered at the level that this matchup suggests he should be. He’s for sure a great GPP play. In the passing game, the Kansas City Chiefs are in always in a strong situation for DFS thanks to the QB. They rank 2nd in pass success rate and have generated 39 explosive passes (ranked 2nd). They’ll be facing a Cleveland Browns pass defense that is ranks 1st in DVOA but ranks 8th in pass success rate allowed. They also rank 16th in fantasy points allowed to the QB position, and 6th in points to the WR position. Deep threats are in an ok spot, as the defense has allowed 25 explosive passes (ranked 18th) this season. The best player to target in my mind is Travis Kelce. The TE position is an abomination on this slate, and Kelce has the elite production across the board to make spending on him worthwhile in this fine matchup. 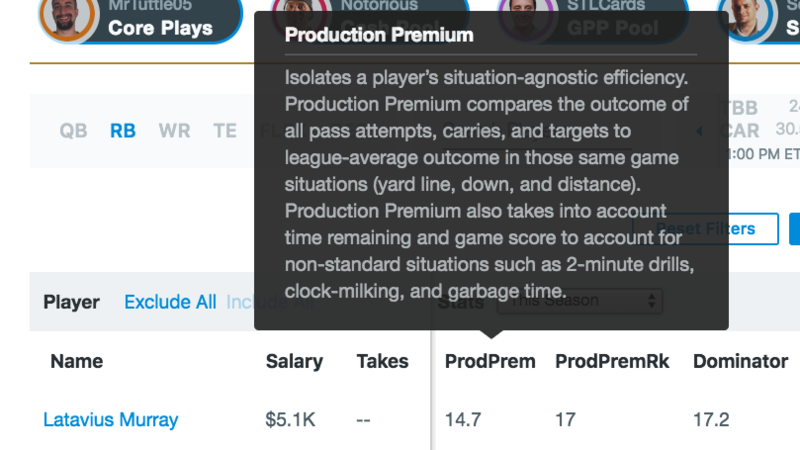 See the productivity snippet for Kelce below courtesy of PlayerProfiler.com. He’s #2 in receptions, receiving yards, YAC, TDs, and fantasy points among his peers. He’s priced at $7,600 on FD, which is less of a value than his $6,600 price on DK (+1.29 RGVal). I’d still use him everywhere. 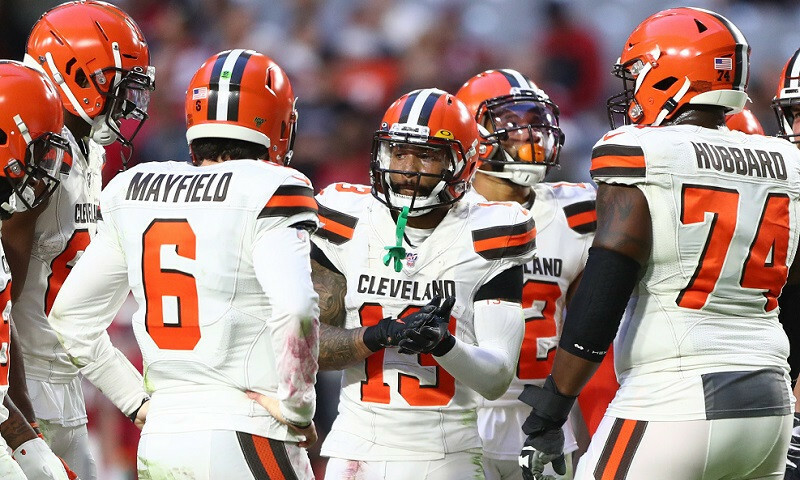 The Cleveland Browns rank 30th in DVOA offense and have the 28th-graded PFF unit. They have faced the 7th-easiest schedule of opposing defenses. The Kansas City Chiefs rank 26 in DVOA defense and have the 24th-graded PFF unit. They have faced the 15th-easiest schedule of opposing offenses. This might be the first time the Chiefs have had the advantage all season but you could also argue playing on the road makes this more of a neutral matchup. The Cleveland Browns rushing attack is in a theoretically strong spot this week. They rank 2nd in rush success rate and have generated 33 explosive runs (ranked 6th). They will face the Kansas City Chiefs run defense that is ranked 32nd in DVOA and ranks 1st in rush success rate allowed. They rank 1st in fantasy points allowed to the RB position and have allowed 37 explosive runs (ranked 2nd). Nick Chubb is taking over 80% of the carries at this point, and unless something changes with the new coaching staff, it’s the kind of volume that can easily pay off a $4,500 price tag on DK and $6,600 tag on FD with a TD and some relatively average production. With a strong game, he has potential in GPP as well. It’s a decent spot for the Cleveland Browns passing attack, but they have a lot to prove before we start pressing the lock button in a good spot. They rank 31st in pass success rate and have generated 28 explosive passes (ranked 11th). They’ll be dealing with the Kansas City Chiefs pass defense that is ranked 13th in DVOA and ranks 23rd in pass success rate allowed. They rank 5th in fantasy points allowed to the QB position, and #9 in points to the WR position. Deep threats will be in a great situation, as the secondary has allowed 38 explosive passes (ranked 1st) thus far in 2018. On “Aggression to the Mean” this week, I hosted and spoke with Josh Hermsmeyer about his air yards buy low model. On top this week was Jarvis Landry once again. A player from his buy-low model has appeared on the Milly-Maker winner in 7 out of 8 weeks, and we should be paying close attention to Landry’s strong combination of target volume and target quality. His individual matchup is not of major concern despite Kendall Fuller having played better lately. 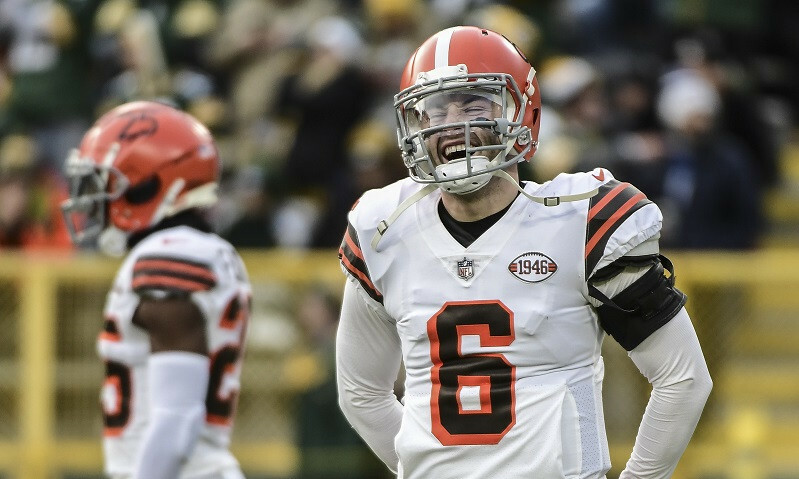 On target throws are a concern, and hopefully Baker starts to locate the ball better and really give this guy a chance to explode for a week winner. The Los Angeles Chargers rank 3rd in DVOA offense and have the 4th-graded PFF unit. They have faced the 18th-easiest schedule of opposing defenses. The Seattle Seahawks rank 2nd in DVOA defense and have the 16th-graded PFF unit. They have faced the 24th-easiest schedule of opposing offenses. The spot is challenging on paper for the Chargers, but they still have a chance. The Los Angeles Chargers rushing attack is in a fairly tough spot this week. They rank 17th in rush success rate and have generated 35 explosive runs (ranked 2nd). They will go heads up against a Seattle Seahawks run defense that is ranked 6th in rush DVOA and 19th in rush success rate allowed. They also rank 21st in fantasy points allowed to the RB position, and have allowed 23 explosive runs (ranked 15th). Melvin Gordon has a hamstring injury that has kept him limited in practice. He missed the last game for this issue, and I’d really rather not dial up a weakened feature back at a high price. Ekeler will be low-owned if Gordon isn’t announced out, and his heavy target share (28%) Week 7 when Gordon missed is far more attractive than anything he can do running it. It’s a deep GPP play unless Gordon is out. In the passing game, the Los Angeles Chargers are in a tough situation for DFS by the numbers. They rank 3rd in pass success rate and have generated 31 explosive passes (ranked 5th). They’ll be facing a Seattle Seahawks pass defense that is ranked 3rd in DVOA and ranks 11th in pass success rate allowed. They rank 32nd in fantasy points allowed to the QB position, and 27th in points to the WR position. Deep threats are in a bad on paper spot, as the defense has allowed 21 explosive passes (ranked 27th) this season. Mike Williams leads the Chargers in air yards share (31.2%) and End Zone targets (6). For GPP play, he makes the most sense of the Chargers WRs given the relatively tough matchup. The Seattle Seahawks rank 18th in DVOA offense and have the 18th-graded PFF unit. They have faced the 8th-easiest schedule of opposing defenses. The Los Angeles Chargers Rank 18th in DVOA defense and have the 22th-graded PFF unit. They have faced the 23rd-easiest schedule of opposing offenses. It’s a neutral matchup. The Seattle Seahawks rushing attack is in a below average spot this week. They rank 30th in rush success rate and have generated 22 explosive runs (ranked 17). They will face the Chargers run defense that is rank 21st in DVOA and 3rd in rush success rate allowed. They rank 20th in fantasy points allowed to the RB position and have allowed 20 explosive runs (ranked 22nd). They keep smashing the ball on the ground and giving Chris Carson the chance to damage even in tougher spots. Carson has had as many as 32 carries in a game this season while last week he carried it 25. This looks like a close game at home and I expect the Seahawks to continue pounding it with a run first identity. Carson is a relatively safe option thanks to a decent role inside 10 yards and more explosive ability than Mike Davis. I still wouldn’t call him a primary play, but more of a glue guy if you need it. It’s not a bad spot for the Seattle Seahawks passing attack. They rank 26th in pass success rate and have generated 23 explosive passes (ranked 24th). They’ll be dealing with the Los Angeles Chargers pass defense that is rank 15th in DVOA and #10 in pass success rate allowed. They rank 19th in fantasy points allowed to the QB position, and 24th in points to the WR position. Deep threats will be in a pretty good situation, as the secondary has allowed 32 explosive passes (ranked 3rd) thus far in 2018. The vertical passing attack is in play again thanks to the Chargers having allowed so many deep shots. The injury and offensive identity have hurt Doug Baldwin to date, but he’s still commanding a team leading share of air yards. He’s an ok option if you think this game gets pass happy, but in a more grinder heavy game flow you’d rather take Tyler Lockett. Lockett doesn’t need volume, and can produce well on just a few big plays. I don’t think I’ll be super high on any Seahawks, but the opportunity for an alternate game script that features the pass does exist. The Houston Texans rank 24th in DVOA offense and have the 17th-graded PFF unit. They have faced the 30th-easiest schedule of opposing defenses. The Denver Broncos rank 7th in DVOA defense and have the 6th-graded PFF unit. They have faced the 18th-easiest schedule of opposing offenses. The Broncos defense is the better unit, but the Texans have just enough tools for me to call this matchup closer to neutral. The Houston Texans rushing attack is in a surprisingly good spot this week. They rank 26th in rush success rate and have generated 27 explosive runs (ranked 9th) against a Denver Broncos run defense that is rank 28th in rush DVOA and ranks 11th in rush success rate allowed. They also rank 9th in fantasy points allowed to the RB position, and have allowed 27 explosive runs (ranked 7th). There is no way I’m going to keep betting on Lamar Miller in tough situations, and I feel obligated to tell you about his opportunity. He has seen just 42.9% of carried inside 10 thus far. He has participated in 176 pass routes and been rewarder with just 18 targets. His market share is still roughly 50% of carries. Even if the matchup says you can like RBs against DEN, we have to still be drafting backs with appropriate workloads. In the passing game, the Houston Texans are in a tough to trust situation for DFS by the numbers. They rank 21st in pass success rate and have generated 28 explosive passes (ranked 11th). They’ll be facing a Denver Broncos pass defense that is ranked 2nd in DVOA and ranks 20th in pass success rate allowed. They also rank 17th in fantasy points allowed to the QB position, and #14 in points to the WR position. Deep threats are in a better spot than the overall passing game, as the defense has allowed 31 explosive passes (ranked 6th) this season. Adam Jones has a few quality metrics that make me pretty sure he’s not washed, but there are enough flags on him and Bradley Roby that make me think Hopkins is in line for mega target volume this week. The pressure rate allowed by HOU is a big concern. They give up a stunning 17% blown blocks rate coupled with a 48.61% pressure rate. Denver is still very good at creating pressure, and if they can somehow find a way to get Nuk locked down it could be trouble for the offense. I’d still bet on Hopkins to do something in what figures to be a high-volume week. The Denver Broncos rans 10th in DVOA offense and have the 12th-graded PFF unit. They have faced the 10th-easiest schedule of opposing defenses. The Houston Texans rank 5th in DVOA defense and have the 9th-graded PFF unit. They have faced the 2nd-easiest schedule of opposing offenses. The Texans have the advantage here but it is not a big gap. The Denver Broncos rushing attack is in a difficult spot by the numbers this week. They rank 17th in rush success rate and have generated 35 explosive runs (ranked 2nd). They will face the Houston Texans run defense that is ranked 1st in DVOA and ranks 30th in rush success rate allowed. They rank 17th in fantasy points allowed to the RB position and have allowed 17 explosive runs (ranked 28th). Royce Freeman is not yet ruled out for the week and the Texans have been stout in run defense as described above. The Broncos allow a ton of blown block and have made up for it with explosive runs, but the Texans don’t allow that kind of production often. Phillip Lindsay is a lower end play for me this week unless Freeman is totally ruled out. It’s a potentially challenging spot for the Denver Broncos passing attack. They rank 22nd in pass success rate and have generated 34 explosive passes (ranked 3rd). They’ll be dealing with the Houston Texans pass defense that is rank 14th in DVOA and 21st in pass success rate allowed. They rank 20th in fantasy points allowed to the QB position, and #19 in points to the WR position. Deep threats will be in a sub-par situation, as the secondary has allowed 23 explosive passes (ranked 20th) thus far in 2018. Nobody is going to care about matchup when they see Courtland Sutton is $3,900 and projected for WR1 workload. I’m seeing some very conservative projection for him still reaching +1 and +2 RGVal without even considering the kind of raw talent upside he has. He’s going to be one of the most popular WR plays of the season, as evidenced by the FanShare Buzz rating shown below of 10. Join the club! Emmanuel Sanders is also in line for a solid workload, and he makes for a deep GPP pivot. The Los Angeles Rams rank 2nd in DVOA offense and have the top-graded PFF unit. They have faced the 19th-easiest schedule of opposing defenses. The New Orleans Saints rank 27th in DVOA defense and have the 21st-graded PFF unit. They have faced the 29th-easiest schedule of opposing offenses. It’s wheels up for the Rams offense indoors against an attackable defense. The Los Angeles Rams rushing attack is in a good but not great spot this week. They rank 1st in rush success rate and have generated 35 explosive runs (ranked 2nd). They face off against a New Orleans Saints run defense that is rank 2nd in rush DVOA and ranks 28th in rush success rate allowed. They also rank 28th in fantasy points allowed to the RB position, and have allowed 13 explosive runs (ranked 31st). Is Todd Gurley still getting all the high value RB touches in this offense on the most explosive team in the league playing in the New Orleans Superdome? Yes. Right then. Let’s not waste time. Jam in Gurley across all formats. All the rush attempts. All the inside 10 rush attempts. All the explosive plays. Plenty of targets. Love it at his DK price, and on FD we can start to have the fade conversation more seriously at over 11k. In the passing game, the Los Angeles Rams are in a destruction spot for DFS. They rank 7th in pass success rate and have generated 40 explosive passes (ranked 1st). They’ll be facing a New Orleans Saints pass defense that is ranked 29th in DVOA and ranks 2nd in pass success rate allowed. They also rank 4th in fantasy points allowed to the QB position, and #1 in points to the WR position. Deep threats are in a fine but not elite spot, as the defense has allowed 27 explosive passes (ranked 13th) this season. I could easily list every player in this game, but I’m going to stick to the most important ones for each team. The Saints allowed the 7th highest rate of clean pockets in the NFL at 80%, and Goff has been throwing from the 9th highest rate of clean pockets at that same 80% rate. When clean, Goff is sporting a 119.3 passer rating and 9.91 YPA. I said 9.91 YPA. Yes, I know it sounds dumb, but 9.91 YPA on 80% of his passes against a team that allows a bushel of clean pockets. Play Goff. The New Orleans Saints rank 4th in DVOA offense and have the 3rd-graded PFF unit. They have faced the 5th-easiest schedule of opposing defenses. The Los Angeles Rams rank 12th in DVOA defense and have the 2nd-graded PFF unit. They have faced the 17th-easiest schedule of opposing offenses. The Saints have the advantage here. The New Orleans Saints rushing attack is in a fantastic spot this week. 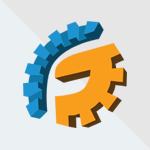 They rank 12th in rush success rate and have generated 13 explosive runs (ranked 31st). 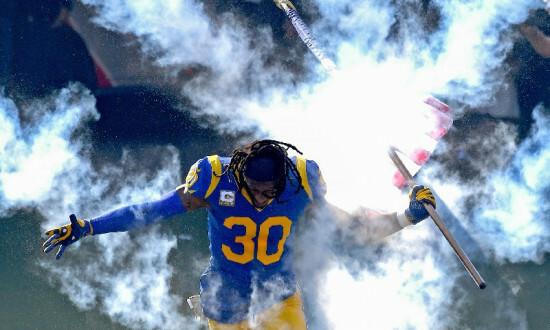 They will face the Los Angeles Rams run defense that is ranked 25th in DVOA and ranks 4th in rush success rate allowed. They rank 18th in fantasy points allowed to the RB position and have allowed 21 explosive runs (ranked 21st). Both Alvin Kamara and Mark Ingram are awesome plays that are underpriced for a 60 point total by a lot on DraftKings. 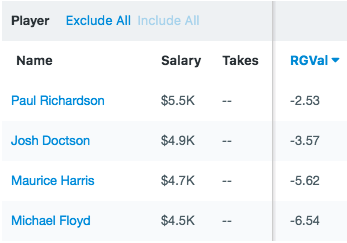 On FanDuel, Kamara is still a good value but Ingram not quite as much. The Saints run the third highest rate of Zone block runs in the NFL at 83.49%, and have the second highest success rate at 52.76%. The Rams allows the 5th highest rate of success to that run type. Kamara runs more often in Zone, and thus I think he’s the main play here. It’s a vertical passing game focused spot for the New Orleans Saints passing attack. They rank 1st in pass success rate and have generated 31 explosive passes (ranked 5th). They’ll be dealing with the Los Angeles Rams pass defense that is rank 6th in DVOA and ranks 29th in pass success rate allowed. They rank 28th in fantasy points allowed to the QB position, and #15 in points to the WR position. Deep threats will be in a secretly awesome situation, as the secondary has allowed 32 explosive passes (ranked 3rd) thus far in 2018. The fact that downfield passing is the weakness here points directly at Tre’Quan Smith. He runs an aDOT of 12.86 and almost 50% of his targets are way downfield including 27%+ over 20 yards. AT $4,200 on DK, this is probably the easiest play I’ll make all season. He’s awesome at $5,100 on FD too. I literally endorse any player in this game, so I won’t waste words supporting them all. Tre’Quan is my favorite. Chris this was by far the best article I’ve read all week. Keep up the great work!